Hugh has been travelling across South America investigating megalithic sites and tracking the path of the famous Rainbow Serpent and Plumed Serpent global energy currents for several years. His recent trip to Peru, Bolivia and Colombia will be under the spotlight in this presentation. Gargantuan megalithic temples that pre-date the Inca exist in these countries that defy explanation and have legends that consistently relate to Virococha, or the ‘Feathered Serpent’, a god who was hugely influential in prehistoric times. He was said to be able to talk any language, summon thunder and levitate big blocks of stone. He introduced agriculture, metalwork and taught the arts of vegetarianism, art and good communication. Like the legends of Quetzalcoatl in Mexico, he arrived from the waters on a ‘raft of serpents’, but who were these ‘serpent’ gods? Where did they come from? 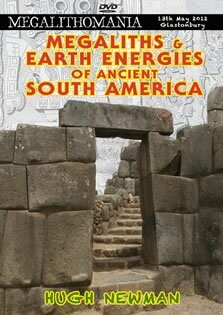 Were they masters of working with earth energies? Hugh will give an overview of all the megalithic sites he visited, including the lesser-known San Augustin in Southern Colombia and the incredible underground complex of Chavin de Huanter in Central Peru. Filmed at Megalithomania 2012. Includes exclusive interview here. 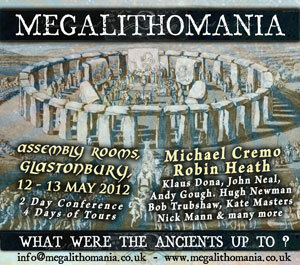 The 2012 Megalithomania conference took place in May at the Assembly Rooms in Glastonbury. Filmed and edited by Gary King, Jonathan Adams and Hugh Newman.